Nestled deep in the mountains, this village was home to some of the fiercest samurai, and that tough mountain spirit lives on. Trails that are part of the Kumano Kodo network of pilgrimage routes run through the village, which feels almost unchanged since ancient times. To experience real village life, you can stay at Omorinosato, a restored Meiji era house, and meet the locals for sushi making, farming and fishing. The Omine-Okugake Trail connects Yoshino and Mt. Omine with the Kumano Grand Shrines in neighbouring Wakayama prefecture. It is part of the route that Shugendo practitioners must take, and follows the mountain ridges. The views are spectacular, but the path is difficult and sometimes dangerous and recommended only for experienced hikers. Tamakijinja Shrine, deep in a forest of ancient cedars shrouded in mist, feels far removed from modern life. It has been a key stop on the Omine-Okugake Trail for over 1,000 years. Now, you can also access it by bus and a steep 20 minute walk, with free green tea and expansive views as your reward. Tanize Suspension Bridge is spectacular in any season, providing safe thrills and spectacular views for those who cross it. On August 4th each year, it hosts an exciting festival called Yuredaiko, when taiko drummers perform on the narrow bridge high above the valley below. 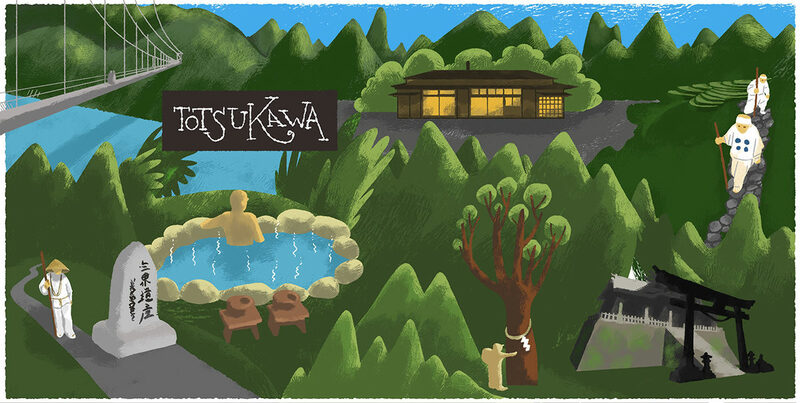 Hikers can enjoy a soak at one of the public hot springs, such as Iori-no-Yu Onsen, which has bath tubs made of local cedar. There is also a free foot bath and cool drinking water. At sunset, the sun dips between two mountain ridges making for a wonderful view. One of the best ways to experience Japanese life is to stay at a minpaku, essentially a homestay. In the rural areas of Totsukawa and the mountains around Yoshino, you can stay at farms with local families, helping to cook the meals or even harvest vegetables. This trail connects the Yoshino and Omine mountains with the Kumano Sanzan, a collection of sacred shrines in Wakayama. A difficult trail, it also serves as the training grounds for Shugendo practitioners. Although not recommended for inexperienced hikers, the parts in Totsukawa around Tamakijinja Shrine are manageable. Read more about the Omine-Okugake Trail. One of the main Kumano Kodo Pilgrimage Routes, the Kohechi is the most difficult and mountainous, with steep, isolated trails up to and over 1,000 metres in elevation. Passing through the beautiful mountain village of Hatenashi, the section from Totsukawa Onsen to Yakio bus stop is easier, however, and can be enjoyed by all. Read about hiking the Kohechi Michi and Omine-Okugake Trail. An excellent destination for intrepid travelers seeking a unique, rural Japanese experience, Totsukawa is easily combined with a trip to Kumano Hongu Taisha and the Kii Mountains. Whether hiking the Kumano Kodo Kohechi Pilgrimage Route or tackling other trails in the area, spring and autumn offer the most comfortable temperatures. Onsen are the biggest draw in winter. Totsukawa has a network of bus routes for getting around, but services are infrequent and almost all information is in Japanese. Visitors should plan trips to Totsukawa carefully, with the assistance of tourist information centre staff in Nara. While Totsukawa is undoubtedly best covered by car, the roads tend to be narrow and winding. Driving in Totsukawa is not advised for visitors unfamiliar with the Japanese countryside, or the faint of heart. Totsukawa offers an off-the-beaten-path experience and requires some effort to reach by public transportation. Make sure to check bus timetables in advance at a tourist information centre such as Nara Visitor Center & Inn. Accommodation should also be booked in advance. A package that includes breakfast and dinner is recommended: dining options and convenience stores are few and far between in Totsukawa. The Kumano Kodo Kohechi Pilgrimage Route that connects the World Heritage destinations Koyasan and Kumano Hongu Taisha, runs through the town of Totsukawa. The route is characterised by steep trails and, although challenging, rewards hikers with scenic views from elevations of over 1000 meters. Hikers keen to attempt the route should be well-prepared and get information from a local tourist information centre before setting out. Deep in southern Nara, Totsukawa can only be reached by bus or car. The bus takes several hours from Yamato-Yagi Station and the best way to reach the station is on the Kintetsu Line from Kintetsu-Nara Station.